Captain of the team is Toby Russ who has been raised in Brunswick County all of his life. I have been fishing in Brunswick County for as long as I can remember. I started fishing off my Grandmothers dock in the Shallotte River at an early age and then would graduate to the golf course ponds where I lived in Shallotte for Largemouth bass. I got my start in King Mackerel fishing from my Dad and cousin Kyle White who would take me along to fish in the Arthur Smith King Mackerel Tournament and the original South Brunswick Islands Chamber Tournament. After a couple of years of fishing the local and state bass tournament circuit I traded my Bass boat on a 23 ft center console and the Mr. Goodhands Fishing Team came to be. Co-captain # 2 is Brother Andy Russ who resides in Raleigh, NC and works in the Landscaping business for a company called TapRoot. Andy has been fishing for as long as he can remember in Brunswick County getting his start from our Grandmothers dock as well. Co-captain is father Rusty Russ who is the owner of R&R Insurance Services in Shallotte, NC. He is married to our mother Polly Russ. Rusty is a native of Brunswick County and has lived here all his life. 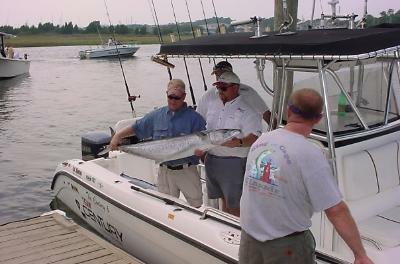 He was introduced to salt water fishing by his father at an early age as well. 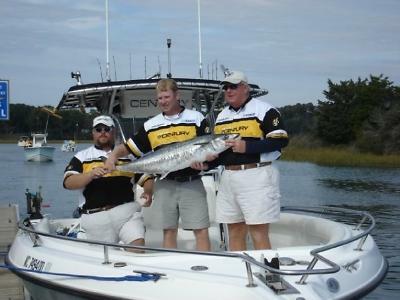 Rusty has been fishing tournaments for many years before we started our team with numerous friends of Brunswick County. Grayson Russ is the son of Toby Russ and is our Junior Angler. His first full season was 2013 and he did great. Jeff Mcdonald, is a Union elevator constructor by trade. He is married to Kim Mcdonald and they have two girls Ashley and Kellie who enjoy the outdoors as much as Jeff does. 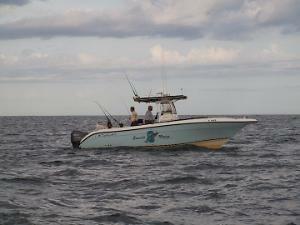 On his off time, Jeff enjoys fishing and diving on his boat the “Undertaker”. He also works part time as a Sea Tow Captain. Jeff owes all of his outdoor skills to his Grandfather. Jeff competed in the SKA for many seasons in the 23 and Under Division with several top 10 finishes, and top 20 finishes. He placed 1st place in the 23 & Under in the 2005 King of the Cape Tournament. Dur Thomason, A lifelong sportsman and boater, Dur spent the majority of his youth chasing the inshore specks and spots of Brunswick County. During his teenage summers at Ocean Isle, he happened to form a lasting friendship with Capt. Toby Russ, and one that eventually led Dur to relocate to the region. He has fished the SKA circuit for a total of 12 years, and despite his proclivity to motion sickness, his love for the water and competitive drive keeps him onboard, and excited to represent Mr. Good Hands and Team OIFC this upcoming season.